Paula Stuart-Warren of Paula's Genealogical Eclectica wrote recently about the advantages of having a genealogy buddy – someone to help you with organization, or help you solve a research problem, or proof something you've written. She advises you "ask your buddy to go to the library to help you do research." Three CGS members started doing that a long time ago. 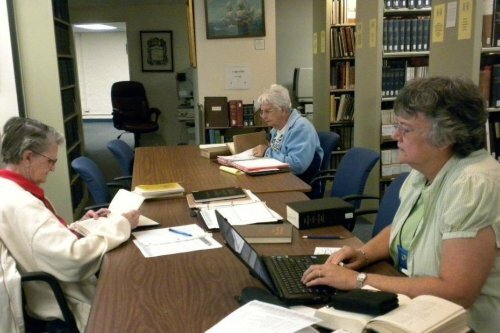 Pat Morgan, Twila Graves and Virginia Kysh are genealogy buddies who come to the California Genealogical Society Library together once a month – every month – for a full day of research. The three friends met at the Antioch Family History Center where they are all volunteers. And what is it that keeps them coming back? It's the excellent New England resources at CGS. It's a message that bears repeating – there is so much more than "California" in the CGS Library. Please come and see for yourself – and be sure to say "hi" to Pat, Twila and Virginia if you see them! Photograph courtesy of Jane Knowles Lindsey, 10/6/2010, Oakland, California.